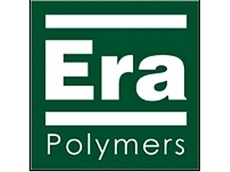 Owned and operated by Industrial chemists Era Polymers have been manufacturing polyurethanes since 1986. Over 3 decades they have accumulated a wealth of experience in the polyurethane industry and are recognised leaders in the global polyurethane elastomer market, manufacturing over 700 formulations. Era Polymers have one of the most diverse ranges of cast elastomer prepolymers in the world including; spray polyurethane; polyurea's, rigid and flexible foam systems, rubber binders and timber floor coatings. To compliment this extensive range of polyurethane Era Polymers also have key strategic alliances to ensure they can offer a solution for all your polyurethane needs. 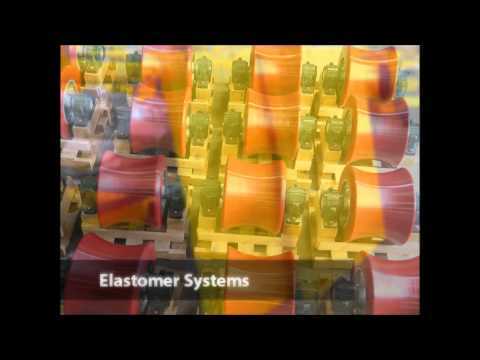 Era Polymers comprises of six divisions: Elastomers, Foams, Coatings, Machinery, Trading and Toll Manufacturing; providing you with a one stop shop for your polyurethane needs. Era Polymers provide a range of polyurethane foams that play a vital role in industries ranging from refrigeration to automotive.Polyurethane Foams offer outstanding durability and high abrasion resistancePolyurethane Foams have the following advantages over conventional materials (wood, rubbers and plastics) Excellent load-bearing weight capability Excellent resistance to oil, grease and chemicals Formulations available in a wide range of resilience’sPolyurethane Foams can be categorised by the following: Rigid: Excellent for different thermal insulation properties. Flexible: Extremely comfortable. Integral Skin: Can be easily moulded for applications ranging from soft to hard. Microcellular: Used in applications which require a combination of comfort and durability. Polyurethane Foams are versatile and suitable for a variety of applications, including the following Automotive: Steering wheels, dashboards, seating, roof linings, rear view mirrors, underlay, sound deadening, sun visors, roof insulation, jounce bumpers, filters. Insulation: Refrigeration, truck body panels, pipe sections, ducts, roofs, buildings, vibrational sound proofing, hot water tanks. Void Filling: Buoyancy, structural, packaging, horticultural, boat floatation.Era Polymers offers a full range of non-ODP (Ozone Depleting Potential) foams which are Ozone friendly, CFC and HCFC free. Polyurethane Elastomers are extremely versatile and can offer a superior cost advantage, performance and a real alternative where plastics, metals, woods and ceramics have been used in the past.Polyurethane Elastomers offer increased abrasion resistance and durabilityPolyurethane Elastomers have the following advantages over conventional materials; Better wear, corrosion and toughness on impact and abrasion resistance Higher durability to withstand impact and shock loading Light weight Higher hardness Resistant to oils, ozone, radiation, mould and fungi Reduced noise pollution in the workplace Pourable and castable allowing cheaper tooling and fabrication of complicated piecesPolyurethane Elastomers are designed for demanding applications, including the following Automotive: Grommets, bearings, bushes and flexible couplings. Building and Construction: Moulds for concrete, gate seals, concrete pump parts and waterproofing. Coated fabrics: Conveyor belts, fuel storage tanks, power transmission belts. Electrical: Encapsulation, insulation, potting, cable joining. Engineered components: Gears, sprockets, wire guides, rail draft gear, stripper plates, press brake pads, textile yarn guides, cutting boards, business machine belts, couplings. Mining: Bucket liners, conveyor rollers, scraper blades, floatation cell impellors, pump linings, grading screens, lined pipes, cross-over pads. Oil, Chemical and Marine: Bushings, bearings, hydrocyclones, buoys, pipeline pigs and scrapers, fenders, valve seats. Rollers: Board rollers, nip rollers, metal forming, printing, conveyor, can coating, paper mill. Seals and Gaskets: Pneumatic and oil seals, diaphragms. Wheel and Tyres: Fork-lift tyres, heavy duty castor wheels, escalator wheels, roller skate wheels, roller blade wheels. 07/01/19 - Two coating products from Urethane Coatings, Timberseal and Monothane Satin were utilised to restore a heritage timber floor in a building in Foveaux Street, Surry Hills, Sydney.The existing floor was made from Tallowwood, a Eucalypt species native to Australia, and had certainly seen better days. 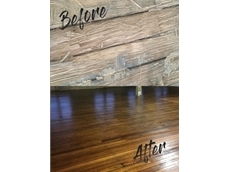 An exceptionally durable hardwood timber, Tallowwood is naturally oily with high tannin content; it is also termite-resistant and often used for timber flooring.Timberseal and Monothane Satin coatings were used to bring this floor back to life. 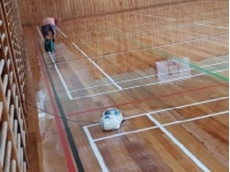 First, the floor was sanded and prepared, after which a single coat of Timberseal was applied, followed by two coats of Monothane Satin.Timberseal has been developed as a first coat for cork tiles, particle board, pine species and hardwoods. It may also be mixed with fine sawdust to slurry consistency for use as a filler for timber seams. A highly flexible first coating, it virtually eliminates edge bonding when heavily applied and worked into the seams, thereby preventing entry of the subsequent coat of Monothane Satin.Monothane Satin is a transparent, single pack moisture cure polyurethane coating that provides a hard finish while maintaining the natural character of timber.Urethane Coatings products are available from Era Polymers. 20/12/18 - Gilt Edge Industries Ltd specialises in supplying an extensive range of flooring preparation and installation accessory products to the New Zealand flooring and construction sectors.Gilt Edge Industries operates a comprehensive distribution network across New Zealand comprising of eight trade depots and storage facilities. The company leverages this expanding distribution footprint to stock and sellan extensive range of premium quality flooring adhesives, concrete moisture control products, engineered levelling cements, transition trims and stair nosings, underlayments and associated products.Gilt Edge Industries also stocks a range of timber floor coatings to which they have now added the Monothane Silver Range from Urethane Coatings, a division of Era Polymers.The Monothane Silver Range includes Silverseal Moisture Cure Polyurethane - Cork & Timber Finish; Monothane Silver Satin Moisture Cure Polyurethane - Cork & Timber Finish; and Monothane Silver Gloss Moisture Cure Polyurethane - Cork & Timber Finish.Key benefits of the Monothane Silver Range include easy application; excellent flow and self levelling; single pack; durability; economical; and suitable for all timber species. 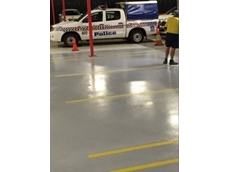 17/12/18 - The application of Eracoat 2K Rapid from Era Polymers on the floor of the carpark at a busy police station minimised disruption by enabling a quick turnaround on the job.Operational round-the-clock, the police station required a high performance anti-skid surfacing solution and line marking for their carpark. Key objectives for the application included increasing the longevity of the carpark by protecting the concrete substrate; improving the aesthetics of the carpark; ensuring an anti-skid surface due to the speed and volume of vehicles using the carpark; and providing clear delineation of car spaces in Safety Yellow.Since the police station was operational all 24 hours, it was not possible to close the area. A solution was required that would not only provide a quick turnaround but also minimise disruption to their operation. Eracoat 2K Rapid floor coating provided them with the perfect solution. Products used by the contractor included Eracoat 2K Rapid in Grey and Safety Yellow for the line markings, and Non-Skid 50 anti-skid particles to achieve the anti-skid finish required across the carpark.The carpark was fully operational within two days.Key features and benefits of Eracoat 2K Rapid anti-skid surfacing included 100% solids aliphatic formula ensuring excellent colour retention; 1:1 mix ratio by volume allowing convenient use; solvent free, hence no flammability issues and minimal environmental impact; rapid curing ensuring high productivity and quick turnaround; resin elongation >70% providing good flexibility with expansion and contraction of concrete; ability to bond to existing coating simplifying application; and 1-3mm aggregate or oxides depending on project requirement. 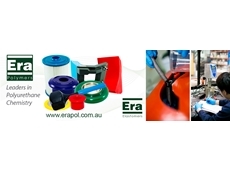 27/09/18 - Era Polymers announces their appointment as distributors for SAIP Machinery in Australia, New Zealand and Indonesia.Italian company SAIP has been designing and building customised polyurethane foam processing systems and machines for over 40 years. 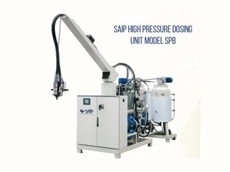 SAIP offers complete production line solutions for continuous and discontinuous production of sandwich and composite panels; complete solutions for the insulation of domestic and commercial appliances with expanded polyurethane; special systems for thermal insulation and pipe joints; and specific technical solutions for turnkey projects among many more.SAIP also offers a vast range of technologically advanced and extremely competitive dosing units including high and low pressure dosing machines and low pressure elastomer dosing machines.SAIP’s distribution partnership with Era Polymers will see customers in the region have access to the very best machinery to meet their polyurethane processing needs.For more details about SAIP’s machinery, please visit the Era Polymers website.